I’ve not looked at Wijmo in some time, so when offered the chance to review a book on it, I thought it would be a great chance to reacquaint myself. Wijmo is a UI library of 40+ controls that are extended from the core functionality provided by jQuery UI. Wijmo is not free, but seems fairly priced for its size. I’ve not honestly used Wijmo in a production environment yet, but it looks great, and it was my hope that the book would give me a feel for whether or not I’d actually use it. 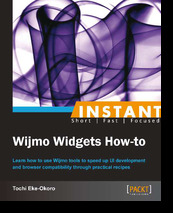 “Instant Wijmo Widgets How-To” was written by Tochi Eke-Okoro. It clocks in at only 82 pages, which is slim, but I have no problem with that. I would imagine that a UI library probably doesn’t need a huge book. I kind of like the idea of shorter, more focused e-books when it comes to technology. You should know, however, that with the front-matter being near 20 pages, you are looking at an approximately 60 page-length book. However, this book does not do that at all. You are dropped immediately into discussion of one of the controls (the bar chart) with no real context of how Wijmo works. That may not be entirely fair. The book does list the dependancies, but for example, it lists a Wijmo Complete CDN and a Wijmo Open CDN. I can guess as to what the “Complete” file is. But the “Open” file? No idea. Nor does the book ever make an attempt to explain it. I suppose I could get that from the main Wijmo site, but I’d expect the book to tell me that. The meat of the book is a look at various controls (7 of them) and a bit of how Wijmo handles data sources. For each control listed, you have a huge block of code followed by a screen shot and a very short description of what the code does. That’s it. Honestly it feels like what I’d expect from the Wijmo docs and no more. There’s never a discussion of how to use the controls in a real app (for example, combining them with a real form). The datasource portion was the only interesting aspect to me, but unfortunately, it was not fleshed out enough to make sense to me. I’ll put some of that blame on me though and am planning on rereading that section to see if it makes more sense on a second reading. Overall, I can’t recommend this book. I can say it did convince me that Wijmo is a good UI framework and definitely worth my consideration in the future, but I’d rely on their own docs instead of this book.